We believe local ingenuity leads to global progress. Yet, while innovation in the government and civic sector continues to grow, local leaders still face many challenges especially in the midst of round-the-clock responsibilities within their communities. Our mission is to be an innovation catalyst: activating cities to imagine and realize what is truly possible. We create and protect kinetic spaces for exploration and imagination, the key to pushing past preconceived and traditional notions and into new territory. We unite mayors, futurists, and business leaders on all sides to collectively develop solutions for the entrenched societal and governmental issues they face. Civic I/O emerged from a deep belief in the power of partnership between the private sector and civic leaders. We want cities of all sizes to benefit from the cutting edge technology transforming the world around them. We want startups to have the opportunity to collaborate directly with mayors on the civic challenges they’re tackling head-on. The first year was our own pilot—mayors heard President Obama speak about innovation, rode in Google’s autonomous cars, learned about a new kind of housing, and judged the inaugural pitch competition. We’ve grown each year since then, igniting and broadening that spirit of ingenuity across the people and places that care most about our cities. Our team has a combined 20+ years of experience in local and national government. IN•PUT / OUT•PUT n, 1. In computing, input/output (I/O) is the communication between an information processing system, such as a computer, and the outside world, possibly a human or another processing system. The growth and success of Civic I/O has been facilitated by the work with our valuable partner organizations. 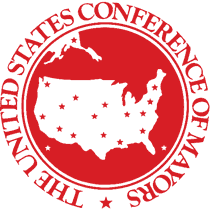 The United States Conference of Mayors is the official non-partisan organization of cities with a population of 30,000 or more, with each city represented by their mayor. The Conference advocates for and supports the development of best practices, impactful policy, programs, and meaningful relationships for mayors among each other and among other levels of government. The Conference’s leadership led by CEO and Executive Director, Tom Cochran, recognized that cities are dealing with emerging technologies and mayors are developing innovative solutions to our country’s biggest challenges. The Conference of Mayors is a proud founding partner of the Mayors Summit at SXSW as they look to be on the cutting edge of new ideas that will transform cities and support mayors. For over 30 years, SXSW has brought together creatives and innovators every March in Austin. The South by Southwest Conference & Festivals celebrate the convergence of the interactive, film, and music industries. As one of Austin’s most iconic cultural touch points, SXSW is an international platform for ideas and conversations that change the world. SXSW understood the importance of mayors and the impact they have on the evolving issues that impact cities and recognized the value of collaborating to help bring the Mayors Summit into reality. The Mayors Summit at SXSW is truly a result of collaborative partnership with the SXSW and SXSW EDU team. Civic I/O works closely with the Institute for the Future, a non-profit research group based in Palo Alto, CA, to develop cutting edge content and trainings for mayors and attendees at the Mayors Summit. The knowledge and vision brought by Jake Dunagan, Director of the Governance Futures Lab at the Institute for the Future, allows us to create unique experiences for mayors and their staff. Jake is an experiential futurist, governance designer, and teacher. He creates tools to increase citizen participation in the design of political systems, and he produces visual media, interactive experiences, and public engagement projects that inject alternative visions of the future into the present. He is adjunct professor of Strategic Foresight at the California College of the Arts and UT-Austin, and International Mentor for the Deseño de Mañana program at CENTRO, a media arts and design school in Mexico City. Interested in participating in or hosting one of our initiatives? Your sponsorships help make our events a reality. Thank you.